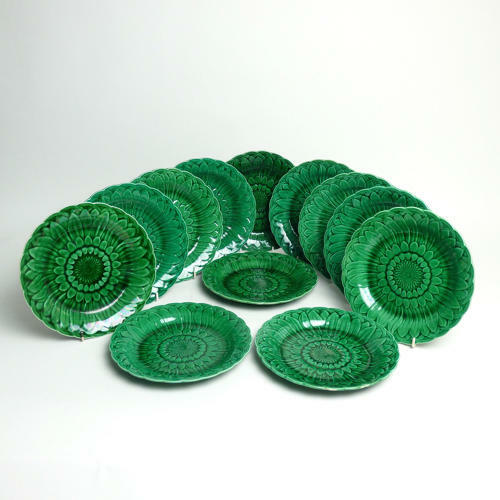 A set of twelve, Wedgwood, green majolica plates. Each plate has an impressed 'WEDGWOOD' mark and they all also have a letter 'F'. There are further impressed letters but these differ. Seven have a letter 'A', one has a 'W', one has an 'S', one has an 'O' and two have 'M's. They date from c.1870. Each plate is moulded with a sunflower and this is then covered in a green, majolica glaze. There are very slight variations in the colour due to the nature of the glaze. One of the plates has a very small chip to the reverse, one has a firing blemish to the reverse and a third has a firing blemish to the face. The firing blemishes are where something has touched the plates, in the kiln, during the manufacture. The other nine plates are all in excellent condition. It is nice to find such a large set. Originally these were made as dessert plates but they work equally well for a cheese course.